The Global Marijuana March has taken place this weekend as cannabis supporters from around the world gathered in 829 cities in 72 countries to put pressure on their governments to legalize the drug. Demonstrators were out in force in the Argentinian capital, Buenos Aires, including wheelchair-bound children suffering from refractory epilepsy. They want the drug legalized for medical use and for it to be regulated for cultivation and consumption. "Using medication with cannabis, a growing number of patients are finding that cannabis is a relief, not the cure, but it will help restore quality of life to people and patients, the children have been suffering since birth,” protester Maria Laura Alasi told RT’s video agency Ruptly. Thousands of demonstrators were out in force, displaying flags, which depicted Bob Marley, while smoking cannabis joints. Rio’s Ipanema and Leblon beaches were the setting as thousands of people marched through Brazil’s iconic city calling for cannabis to be legalized in the country. Brazilian politician Renato Cinco took part in the march and he told Ruptly that legalizing cannabis could help to bring down the country’s rising prison population. "To legalize marijuana would make a big difference, first to fight the oversaturation of prisons. Today in Brazil, the majority of [drug] traffic prisoners are there because of selling marijuana that way legalizing it would reduce the number of prisoners,” he said. Some 20,000 marijuana activists gathered in Queens Park in Toronto to take part in the 18th Global Marijuana March. A number of those taking part wore fancy dress costumes, while they chants of “free the weed” could be heard. 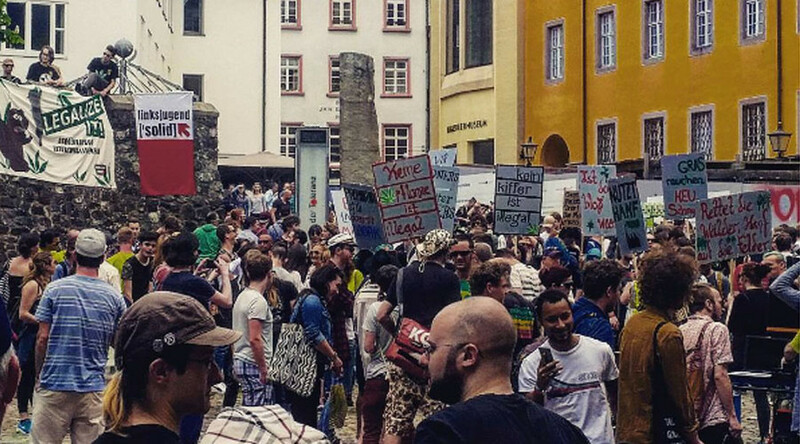 Cologne was one of several German cities that saw demonstrations taking place to try and force the government to legalize marijuana. Thousands of protesters took advantage of the good weather to take to the streets, while music blared out from a float. German supporters of relaxed cannabis laws won a partial victory earlier in the week when the German government said it would allow pot for those who suffer from serious illnesses if they have no other treatment options. Thousands of demonstrators were out in force in the capital of Spain, Madrid, on Saturday. A yellow open top bus paraded through the streets, which blasted out music from its many speakers, while there were plenty of green balloons on display with a marijuana leaf printed on them. Thousands of pro-cannabis supporters took to the streets of Cape Town in South Africa. There were plenty of placards on display, while chants of “free the weed” could be heard. "We were marching for the legalization and regulation of cannabis in South Africa," lead organizer Johannes Berkhout told AFP. "There is more than enough evidence around the world about the medicinal benefits of cannabis," he said, adding that legalization would create a "safer and much more controllable" use of the drug.